MAGRUDER Queen’s Ferry Press Blog. Take 2. I’d Also Like to Thank…. In early November 1996, I was on a train from Baltimore, where I lived and worked, to New Haven, where I had spent most of the ‘80’s in graduate school, first in the Yale French department and then at the Yale School of Drama. I was making the trip because a musical for which I had written the book, Triumph of Love, was going up at the Yale Repertory Theater, with pre-Broadway hopes. Avoiding my overdue rewrites for Triumph, I began a novel, one that would celebrate my crazy first year—1983-1984—in the French PhD program, when I lived in a graduate dorm called Helen Hadley Hall with a host of international eggheads, who were whip-smart about everything but the directions that their hearts and groins should follow. I wrote in longhand in a spiral notebook. Bill Clinton had just beat Bob Dole and won his second term in office. It was that long ago. Broadway came and went the following year, but I kept on with my dorm of fools. 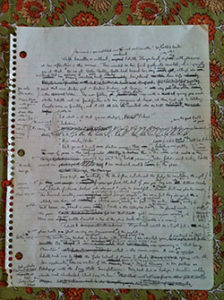 I finished a first draft in May 2001. Then titled Love Flight of a Pink Candy Heart (after a Florine Stettheimer painting), the manuscript was 145,000 words long. It had nineteen major characters. It was written mostly in dialogue. Imagine A Confederacy of Dunces (one of my favorite comic novels) without an Ignatius J. Reilly at its center. Imagine a sprawling, mid-career Robert Altman movie, not the glorious Nashville, but one of the lousy ones, like Health or Prêt-à-Porter. That was my baby, and like Ignatius with his journal entries, I thought the work was “particularly fine.” Clearly, absolutely, indubitably, I didn’t know what I was doing. That was nineteen years ago. When Love Slaves of Helen Hadley Hall is published next May by Queen’s Ferry Press, it will have been two decades in the making, nearly a third of my life. My baby girl has lost nearly 68,000 words and is now the age of a college junior. The academic year she recounts is prehistoric: pre-cell phone, pre-Internet, pre-sushi, pre-cash machine (at least in Connecticut), pre-Fall of the Soviet Union. Madonna was a brand-new artist. The Apple Corporation released its first MacIntosh personal computer. President Ronald Reagan created a holiday in February for Martin Luther King, Jr. That “the gay cancer” was caused by the HIV virus had yet to be discovered. But enough with the plot points. I was supposed to write about acknowledgments. I have noticed that with each additional book a fiction writer publishes, his or her acknowledgments page gets shorter. Love Slaves is my third book, and I find that my roll call of personal debt grows longer every time. If I were to acknowledge all the creatures great and small that contributed to the gestation and publication of Love Slaves, it might read longer than Heart of Darkness or In Praise of Folly. Thanks to the Publications Intern at Center Stage, my former employer, who, in 2000, cheerfully converted my floppy discs (remember those?) from older Word Perfect files to other formats, leaving me to correct tens of thousands of diacritical marks (e.g., a “ in the first program changed to ^ in the second). Thanks to Center Stage for allowing me to abuse the copy and postage machines when every February I mailed a three-pound envelope with hopes of winning The Peter Taylor Prize. Thanks to Arlo Crawford, über-agent Bill Clegg’s assistant for his kind rejection in 2002 in which he said Love Slaves was like “a younger, hipper Robertson Davies,” thereby giving me a handle with which to besiege other agents early in the present millennium. Thanks to the agent who personally called to tell me that a professional manuscript should be double-spaced. I had been using a 1½ space format. (Less paper, less postage, less expense.) Thanks to the Wheaton-Warrenville Wolverines, Class of 1978, whose last names I commandeered for my characters. Thanks to Poets & Writers magazine: every two months I could keep the dream alive via the contest listings in the back pages. Finally, I find myself most especially grateful to IVAX Pharmaceuticals, over in Ireland. They sell a product called PROAIR-HPR (aka albuterol sulfate), an aerosol inhalant for people who have occasional breathing problems. Believe me, when I started Love Slaves in 1996, I didn’t have late-onset asthma, or a mortgage, or back hair, or a testy male bladder. Or, most important of all, the proper narrator for the novel. In the wee morning hours of 11.11.11, I was having trouble sleeping in my bedchamber at the VCCA. I’d been there for nearly a week and felt that my rewrites, to be frank, sucked. I woke up wheezing and panicky and without talent. After a trip to the bathroom, I picked up my inhaler. Albuterol acts as a stimulant. One puff—I might be able to fall back to sleep. Two puffs—forget about it. Breathe or sleep? I took two hits. I tossed and turned, waiting for my bronchial tubes to re-open while my mind roiled with authorial dissatisfactions. I was a third of the way through what I hoped was my final draft of Love Slaves, but the narrator—my fourth in a decade, mind you—was still giving me trouble. What if I left the VCCA early?—What if I applied to nursing school?—what if X were the narrator? Eureka! Hallelujah! Holy Christ, what took you so long? You never saw such a happy face at the VCCA breakfast bar. I raced to my studio and went back to page one. It would take me another two years to complete this final rewrite, in a gated marble prison of my own devising on Mutungo Hill in Kampala, Uganda, and then another year to find Erin McKnight at Queens’ Ferry—but those stories are for another day, perhaps. In the meantime, then, a huge shout-out to IVAX Pharmaceuticals, and personal thanks to the reader who can tell me the numerological significance of a triple eleven. James Magruder is the author of two previous books of fiction, Sugarless and Let Me See It, and the book for the Broadway musical Triumph of Love.